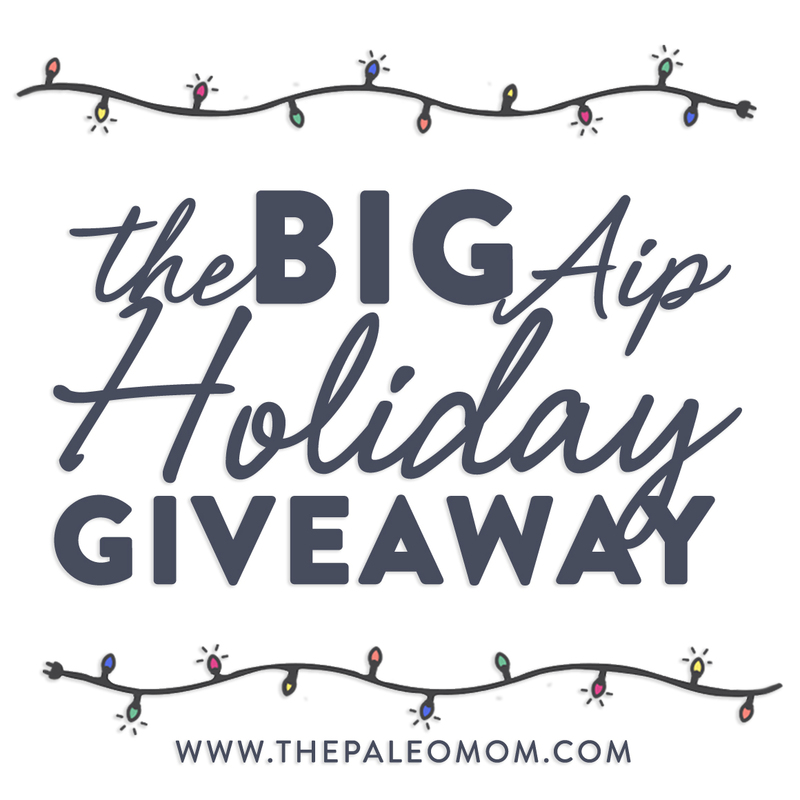 Home » Blog » The BIG AIP Holiday Giveaway!! As the end of the year approaches, I take time to both count my blessings and start thinking of goals and resolutions for the year ahead. This year, I find myself thinking about those of us who struggle with autoimmune disease and the unique challenges we face on our paths to healing. The holiday season is a time filled with merriment and togetherness, but it can also bring temptation, added stress, exhaustion and a flood of emotions—especially for those who are newly-diagnosed or who recently experienced a flare. If you’re embarking on the Autoimmune Protocol in 2017, knowing how to get started and how to prioritize, gathering the right information, and finding the right tools can seem like a big job! First of all, you’ve got this. 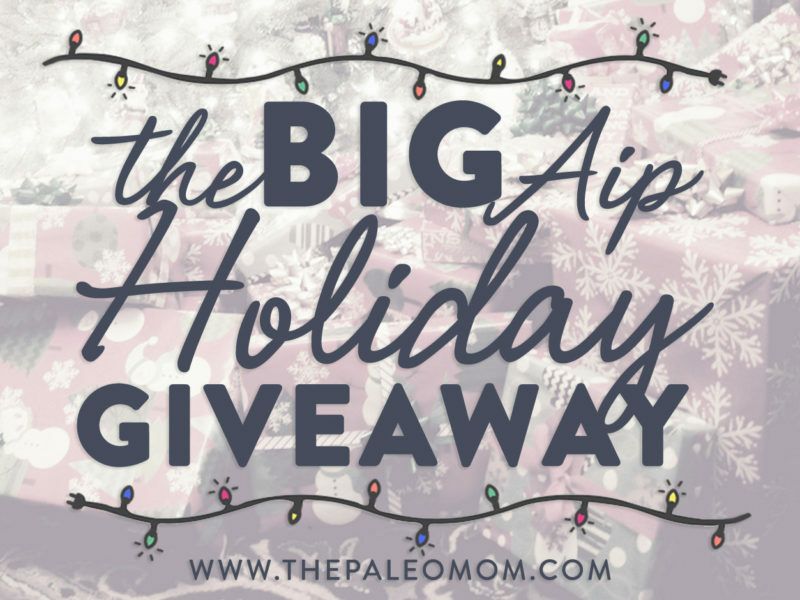 Second, I know there’s a learning curve to the AIP which is why I decided to put together this epic holiday giveaway for the autoimmune community! The BIG AIP Holiday Giveaway will provide some incredible help on one winner’s path to healing. This prize package includes incredibly gracious contributions from people who care deeply about this community. So after you enter, you can use this as a solid list of who to look for for support! Check out what’s on offer below, then head to the bottom of the page to enter. Happy Holidays everyone, and good luck!! The Oura ring is the best sleep & lifestyle tracker on the market! Due to customs regulations and shipping limitations, this giveaway is open to US residents only (sorry). One winner announced Christmas Day! Please allow up to 30 days for all prizes to arrive. 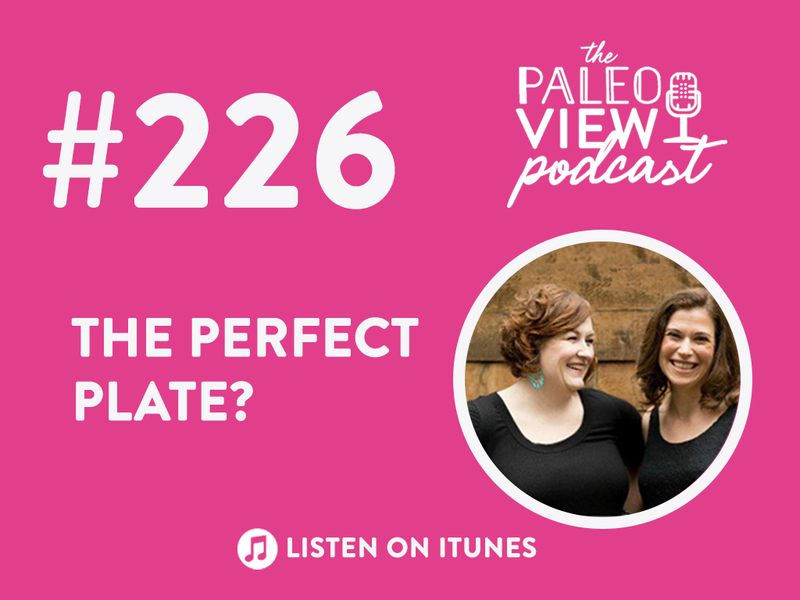 Previous Post: « TPV Podcast Episode 226, The Perfect Plate? So excited about all those cookbooks and the oura ring! Thank you for this opportunity. These tools would go a loooong way toward helping me on my journey. Best to you! I am excited about the 32-piece box of Sweet Apricity Caramels. I’ve had them and they were great. Gave a box to a friend. We had a contest to see who could make theirs last the longest. I don’t know which part is most exciting, but Paleo friendly caramels sure sound awesome! I am excited about any chance of winning any of the awesome prizes. The books would help me a bunch. That’s what I’m most excited about as well!! And then the peptides and power balls as well! I would love the Oura ring. I’m excited about the Power Balls and support for another round of AIP! I’m most excited about the Oura ring! Sleep is one area I am really working hard to master! I’m most excited for the Paleo On The Go $150 Gift Card. It would be nice to give my wife a break from all the food prep she does! I’m excited about all of it, but mostly the aura ring and the caramels! Yum! I’m excited about trying the Oura ring! I would love to try the Oura ring!! All the items look fabulous! So it is hard to just chose one! But if I had to chose I guess the cookbooks cause I can use all the help I can get in that category! Praying I can win this….New Year= New start! How can I pick one thing I’m most excited about?? I do love all of them and if I had to pick, I guess Barefoot Provisions would make me really happy – they have an amazing selection!!! I’d love to win this amazing gift package. There are so many great items. Thank you for the chance. I would love to win gift cards to try any food. Round 5 or 6 of SIBO treatment with a year and a half “clear”. It’s frustrating to start all over again, and it’s all very expensive, but I have hope for a better 2017. These gifties would help! The Morocco method hair kit. I’m most excited about the books! This is such an awesome giveaway! I’m excited about the Sweet Apricity Caramels! 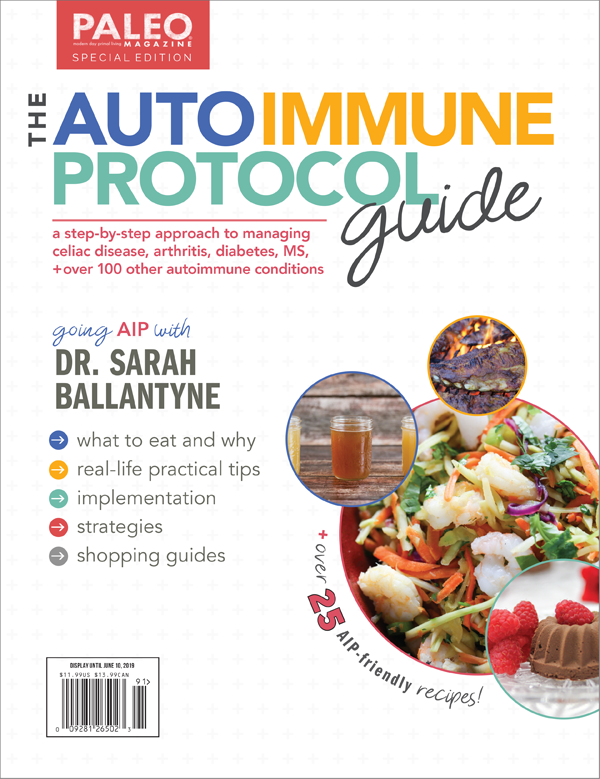 I’m excited about it all, but being new to AIP (thanks horrid flare that won’t die), I’m excited about all the cookbooks and resources! How could a person pick one thing?! The books and powerballs might get opened first if I were to win. I love the cookbooks! I have several in ebook versions, but I would love to have the hard copies to be able to flip through! I’m excited about the power balls! Yes this is awesome! ?? I’m excited about the Vital Protiens products! I would looove to try the Caramels, I have ‘eyed’ them forever, but not been able to order yet! I am excited about the collagen protein powder and oura ring! I would love any and all the cook books! I’m most excited about all the books! I’m a huge cookbook fiend, it one of my favorite things to acquire. 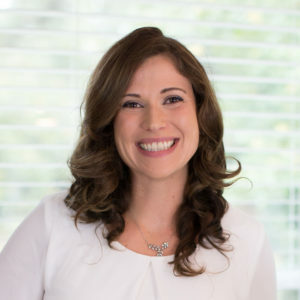 I also am a huge nutrition and science lover so I would love the opportunity to understand the reasons behind why my body isn’t functioning optimally and what I can do to fix it. Thank you so much, Sarah, for all that you do. I’ve struggled for my than half my life with life-threatening health issues and because of you, I feel like I can finally start fighting back. 2017 here I come! This is an awesome giveaway! I’ve been Paleo for a while but really want to go full force AIP to get rid of all my thyroid antibodies! This would be some awesome tools to help! How do you choose a favorite out of all those wonderful and generous gifts?!?! I’ve been wanting an Oura ring!!! I’ve also really been wanting to learn about the AIP diet and how to start it! So all if those resources and products….oh my!!! My health is very poor from multiple autoimmune diseases and I desperate to get well! This give away is amazing. Your blog has been so helpful on my brand new aip journey. Thanks! I am excited about all of the products featured in this give away! They’re AMAZING! I have some of the AIP books but am excited for the AIP friendly products and the coaching help! Making the transition from gluten free to strict AIP is challenging and I am excited for all of the help I can get! That Oura Ring looks awesome! wow this is certainly a big giveaway! I am most excited about all of the cookbooks!! Everything looks amazing! I especially would love to try the caramels ans spices. What a blessing! Thanks for doing this! What a fantastic, generous giveaway! Happy holidays! What an amazing package…I have to say, those caramels changed my world view on eating a sweet:) what I love most is it encompasses such a huge array of support. So helpful when dealing with autoimmune. I feel the more I know, the more I can share with others, resources that have valid science and function. There are so many good things in this awesome giveaway! I can hardly pick just one! The Paleo on the Go gift card would be great opportunity to try new things though! Wow this looks incredible! I’m excited about the morocco methods set, I’d love to try them after reading your rave reviews. All prizes are amazing I love book books but the Barefoot Provisions gift card would be nice to win.. thanks for the chance .. Happy holidays ?❄⛄? So many things! I’m truly excited about it all but would love the books! I cannot even imagine winning hand all of this! I have been scoping out all of these items for over a year. But I never spend money on myself so, they are out of reach. I angry scalp and sensitive skin would definitely enjoy the MM and skin care. One can only hope! I’m excited about the Oura ring! I am most excited about the coaching session and all the books! It is like a trip to the Wizard of Oz-can you help me help myself to improve my health?? I had never heard of the oura ring before. So cool! Coaching products would be the best for me!! What an amazing package! I am new to the AIP world & trying my best to learn of all the tips & tricks! What a great opportunity to share with my girlfriend new products & ideas & really learn how to take the next steps! Excited for whoever wins the package! I am most excited about the sleep tracker! A good sleep tracker would rock my sleep socks! This is great – the Oura ring looks intriguing! I am so excited about the printed resources that you are making available. As a self-described information-junkie, I would be thrilled to receive copies of your work, along with so many other leaders in the community! Thank you for all the work that you do on our behalf as the AIP community! This would be an amazing new year jumpstart!! Wow, awesome giveaway! Looking forward to trying the Vital Proteins Collagen Peptide. Would be so amazing to get the cookbooks and/or gift cards – those things add up very quick!! I love the books. The Paleo Approach is on my Christmas list. All of the books! I love reading about health and learning all that I can. I’m excited about Morrocco Method! This is such an incredibly generous giveaway! I have your books and have tried the prototcol but have “fallen off the wagon” over the past few months. Winning this would be an incredible kickstart to getting back to where I need to be in 2017. I am super excited about all of the cookbook and the vital proteins collagen! THE BOOKS! Wow I’d love to grow my knowledge with so many of those! Everyone always wants to borrow your books from me so I’d love to obtain loaner copies for my library. Such a very generous give away! I cannot possibly choose a favorite! What an amazing giveaway!!!!! I am excited about the powerballs. I’m excited about the spices! Trying another comment as my email address was wrong in the last one! I’m excited about the spices and cookbooks! I never got coached, I am always eager to learn from the pros 🙂 …and try new AIP products. Everything but the white Oura ring is my favorite! Most excited about the Self Care Goodies, because that is an aspect of AIP & Paleo that I have not had a chance to explore yet. It’s hard to pick what I’m most excited about, there’s so many new-to-me things on this list! But maybe the foods? Or the ring? Sooo excited about this giveaway!! I’m probably most excited about the books. We are new to this, so we’ve got a lot to learn! I am most excited about The An Oura Ring. What an amazingly thoughtful and generous idea while a great way to help someone out on this challenging path! I’m super excited about a number of things, but mainly the books and coaching session. Thank you so much, Sarah and all the contributors! Excited about the books and self care items! Oh, and all of it!! ? What an amazing and generous giveaway! It would all be a huge help but the cookbooks and consulation would be incredible to have right now! I’m 36 weeks pregnant and my digestive system is shutting down…..having several autoimmune conditions and digestive disorders, this giveaway would be a huge blessing right now! I am most excited about the ring. My wife really wants one. All the products, especially the primal palate spices! I would love all the cookbooks! I am most excited about all the cookbooks included! I would love to experiment with all those new ideas and recipes! So excited for this! 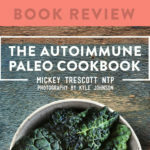 With a recent diagnosis of Mixed Connective Tissue Diease, I’m trying to get the best handle on how to stay healthy and have been seeing awesome results with AIP/Paleo! Would love all the books! What a generous giveaway and fabulous list of resources! I’ve purchased some cookbooks, but I’m excited to dive into The Paleo Approach. I think it will be a great tool to reference as I begin working with my new Functional MD! I’m most excited about the oura ring. The Oura Ring!!!! I want one SO badly. I’d love the gift certificates because I have a limited income and struggle to eat nourishing food. Wow!! What a great gift. AIP is a hard lifestyle and diet transition. These resources are wonderful. Any of this would be a blessing! I’m so excited to try many of the things in the giveaway! What a great way to start 2017 and go deeper and more successfully in the Paleo lifestyle! Thank you for all the insoyration you always provide! All of it sounds wonderful but most excited about all of the books!! I am so excited about this! Both my teenage daughter and I need to try this but we just don’t know where to begin. This would be such an amazing way to get us started on the right track for the rest of our lives! What a great opportunity to get my hands on the stuff my body needs and I love this website! I’m excited about all of them! Having all the books would be amazing!! THE OURA RING – yassss. This would make my year. I am excited about the Vital Proteins Collagen! Holy cow! What an amazing giveaway! Thanks to you and all the other people and companies involved! Wow! There’s so much! I’m just starting my AIP journey and this would definitely help! I love all the snacks and have been wanting to try Morrocco Methoday for over a year now. I’m looking forward to getting the Autoimmune Wellness Handbook. I just bought a copy of it for myself, but my friend’s 12-year-old daughter was just diagnosed with lupus, so I gave it to her. All of the AIP books and cookbooks!!! I have been working with a functional doc and we’ve started AIP along with some other restrictions. I’m super excited for the AIP spices because majority of the spices I used to use I can’t use anymore. What an awesome giveaway thank you for the opportunity. Wow! What an amazing giveaway. It’s hard to say what I’m most excited about… probably the books and ebooks. I would love to have those resources to keep referring to! Wow what an amazing giveaway. I haven’t heard of a few of these sites/blogs so that’s helpful too! This is the most amazing giveaway!! What a blessing it would be to have all the cookbooks!!! I’ve posted to FB twice, but it’s not giving me “credit.” 🙁 I don’t have twitter and it won’t let me e-mail. What an awesome giveaway! Most exciting for me would be the books! This is such an amazing giveaway! Thank you so much for putting this together! I am excited about the books! The cookbooks would be amazing to have as a resource! Books, books, books! What valuable resources to have at your fingertips! Such an incredible giveaway, can’t beat a gift of good health items! So awesome! I want that amazing stack of cookbooks! I am most excited to try the Vital Proteins collagen! I’ve been meaning to try it for a while now. I’m excited about everything in this package!! But if I have to choose I think I’d say the cookbooks and Powerballs! The books would be best to reference! O h how I could use this … 2017 = newbie Paleo for me! 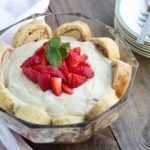 I’ve already tried starting on AIP (and Low FODMAP) and it sure isn’t easy. Would love the help! The books would be so helpful! It’s so hard to pick any one thing, since they are all exciting giveaway prizes! However, the cook books, food items and self care prizes caught my eye! Thank you so much for the opportunity to win such wonderful AIP goodies to help us in our health journeys! I need all of it! Help with my hashimotos! Wow, what a neat contest! Everything sounds awesome but I was just reading about that Oura ring….intriguing!!! Wow, this would be an awesome Christmas present! All the cookbooks–especially the Healing Kitchen! 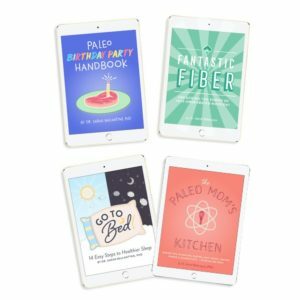 Everything in the giveaway is great but all the books would be great addition to my small Paleo library. I’m excited for the cookbooks, especially since they’re signed by some insanely inspiring AIP authors! I’m entering for my daughter who’s on the AIP, though she’s been trying to convince me to try it. So I’m excited about the SAD to AIP course, I’d keep that for myself and maybe those caramels too. The Oura ring looks awesome! And so do the caramels ? Would love ❤️ to win. ? The Oura Ring is what’s most exciting! The physical activity side of AIP is where I struggle the most, I think a fitness tracker would be a great booster to that! This is an awesome collection! Thanks for making this giveaway available. This is an awesome giveaway!! The cookbooks and everything else would be amazing to win! I am most excited about the books and coaching help. What an amazing & awesome giveaway! Thank you for the opportunity to win! I would be so excited to win all those awesome books! I love books, and I’ve borrowed several of these from the library. It would be so amazing to be able to add them to my permanent collection. I am excited about the books. I have been playing with the starting AIP and winning could be just the push I need! I’d be most excited about the AIP guidance. My girlfriend was diagnosed with uveitis, rheumatoid arthritis and sarcoidosis at the age of fourteen. She is now forty-one and has undergone several unsuccessful surgical procedures that were performed to quell inflammation and counteract the negative side effects of experimental steroid medications that were used to treat her condition. Her doctors have never even mentioned dietary changes as a treatment option. I don’t have autoimmune disease, but I’ve decided to adopt the Autoimmune Protocol with her. It’s quite a daunting task, especially learning what foods are acceptable and how to get them with limited availability. Recipe and meal planning advice would also be very helpful. Transitioning to AIP in January and would love to have those books to help me through it. Oh my gosh!!! What an awesome giveaway. I was excited about the cookbooks until I saw the spices, then I saw the caramels. Don’t know which I would love more. It’s all so new to me. I NEED to get started! Been fooling around for a year and can’t get serious! Help! I am most excited about the Sweet Apricity Carmels! What an amazing giveaway! I’m excited about all of it! I was recently diagnosed with Hashimotos so I am most excited about all the AIP books and self care books! 2017 will be all about me regaining my health and feeling good again. Who could pick one thing to be excited about. It’s all so great! Wow!! I’m excited about the AIP cookbooks. I live and thrive with UC and know how much my life style, food choices and stress affect flare ups. I’ve been paying attention and have incorporated some aspects but want to try a full AIP shift in my life. This give away would be a stepping stone. I can’t even tell you which one of these prizes I want the most, they’re all so wonderful! I would love to win this, especially since I will be embarking on an AIP reset in the new year and could use all the supportive tools I can get! I can’t even decide! This is the most amazing Paleo/AIP giveaway in the history of forever!! I’d love all the books and collagen. What a great give away! I haven’t purchased any cookbooks yet, so I’m super excited about those. Also the oura ring would be an awesome prize. Cookbooks for sure, although I have some of them already! Oura ring!!! No way! This pack is amazing!!! I need to go AIP and I keep pushing it off… what a better way then with with all the right tools! I’m really excited to possibly get the Cookbooks! I am most excited about the spot in SAD to AIP in SIX. I’d love this support. But I am also excited about the Paleo on the Go Certificate and the Powerballs. I love both companies! I am excited about the cookbooks. I am my st excited about the Autoimmune Wellness cookbooks. But it all looks amazing! I am new to ASiP so any and all of this would be wonderful. I have gotten a couple of cookbooks and have others on the wish list. I’ve heard of Paleo On The Go but haven’t tried it yet! And there are many things I haven’t even heard of yet! God bless you for doing this giveaway! Most excited about the Oura ring! Best giveaway ever! I’m excited about all the AIP friendly products.! As a relative newbie, it would be great to be able to try a variety of products to help me transition to this lifestyle! I am extremely curious about the ring! I would love to use one. I really want to try the Morocco Method and the power balls! What a great giveaway! I’m excited about all of it. Starting AIP is daunting, but Amy of these prizes would make it easier and give me the kick in the booty I need to get started! WOWOWOW! I would be MOST excited to work with Jo for an hour!!!! Thank you for doing this for all of us AIP’ers! The ring looks amazing! I also totally need the books as I’m in such a rut with AIP. I’m excited about all of the books! They’re all on my wishlist! So much valuable knowledge in there! I am excited for the Paleo On the Go gift card! Any of these would be great for my sister as her 3 year old is in the AIP diet for severe allergies! This is an awesome giveaway! Saves a family so much money especially as the New Year approaches!! Oh my gosh, how do I pick one favorite??! BUT, I have been dying to try those power balls! So excited for the One Stop Paleo shop certificate, power balls, spice pack, collagen protein, and cookbooks! Wow, this pack is amazing. I have an autoimmune disorder and this pack would help me so much! I am really excited about the SAD to AIP in six. I could really use help with a reset. I would also love to give some of the books to my mother, since l have a couple already. I am very excited about the books! I have been following the Paleo lifestyle for two years and my husband recently joined me on this journey. I would love to be able to gift him with these so he can educate himself!! I’m most excited about the Paleo on the Go gift card. I would love to get all the books especially the cookbooks to keep me on track with all the healthy recipes. This is such a generous offer. I’d be most excited by the coaching options! This prize would mean the world to me. I have been battling psoriasis since my twenties and keep striving to live a healthier lifestyle. I would love the boost to my momentum this package would give. Regardless of whether I would win it or not, Whoever wins it, I wish you the comfort of witnessing your own body healing! It is a slow process, but hopefully we can all get there! Thank you so much for the incredible giveaway! As I’m embarking on my healing journey all of these items would be so helpful. Especially excited about the Oura Ring!! What an incredible Christmas giveaway! All the items look amazing! I’d love the books, ebooks or Vital Protein!!! I also like the unique items I wouldn’t normally buy for myself like the Morocco Method products, coaching and Paleo On The Go. I would be so excited to in the Morocco Method soap, I have always wanted to try them! Excited to check out these sites and work toward my goal AIP diet in 2017. Thanks for the resources! I think they are all great and well needed, however, I am most excited about the cookbooks as they are something I can use forever. I can’t wait to try the goodies either. Hopefully, I’ll find something new I’ll want to get again. Im excited most about the collagen peptides! 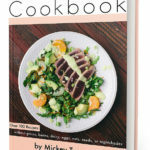 I am excited about the cookbooks the most although everything in the giveaway is awesome! I collect cookbooks! All of the products, but specifically the books (cookbooks). I would be so happy to get The Healing Kitchen. I don’t have room in my budget for cookbooks right now. I can’t wait for the cookbooks! I think EVERYthing is fantastic…winning such a give-a-way would enable me to share excellent information with so many different people!! Thank you for making this opportunity available and wishing you a very Blessed and Wonderful Christmas!!! The books/cook books, primal life orgánica, and vital choice. ? Thanks for the giveaway! I’m just overwhelmed with all of the items. I’ve been trying to switch to AIP for awhile now, but the old habits keep getting in the way when I’m tired, short on time or whatever other excuse. How could I not get this right with this amazing package of items!! what a wonderful healthy give-away – a great jumpstart to helping with a healthy New Year. It all would be amazing, but I am most excited about Morocco Method! I’m excited about all the products – they all sound great! I think I’m most excited about the gift cards. I’d love to try the Primal Palate spices! I am super excited about the Morroco Method products! I would flip over winning all of those books, Paleo on the Go gift card, Powerballs (I’ve always wanted to try them!) , the hair care products…. I cannot pick just one because there are way too many awesome things to choose from! Any of the items above are amazing. My daughter has been eating this way since 2014 due to health reasons and I think she would enjoy the items from the AIP-Friendly Products $505 list the most. This is a generous give away. I’m excited for the gift cards. I had never heard of the Oura ring. That sounds amazing! I’m most excited about SAD to AIP in 6! I am most excited about the Oura ring ..and the gift certificates! The oura ring and marine collagen really catch my attention. I am excited to try those! This is an amazing giveaway! The gift cards are wonderful, but the cookbooks are so helpful. It is really hard to think of different ways to prepare meals within the AIP protocol and we end up with the same rotations a lot. 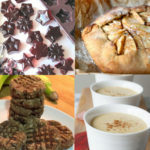 I’m excited about several things- AIP coaching, new AIP foods to try and the French cookbook! I could make such incredible use of the books and the coaching! I am struggling so hard to find answers and make changes to help myself. I need inspiration! I have been gf for quite a few years and have removed a lot of other allergens at times but really need to do the AIP plan and heal my gut and help prevent so many diseases and disorders. My mother died of Alzheimer’s and Parkinson’s diseases. Thank you for all of your information and the opportunity to win such an awesome prize package! I will definitely be sharing if I win! I’ve been trying to get my girlfriend with primary progressive MS to follow this protocol! I’m most excited for all of the great books!! I am most excited about all of the books! Thank you for this great opportunity. I’m most excited about your other books! Thank you for the opportunity!!! The coaching and the products are what excite me the most. I’m looking forward to the Vital Proteins. The Oura Ring would be amazing! I had never heard of the Oura Ring until seeing this and it looks amazing! I’m at a place at 58 where my eating habits have caused increased health issues. I have had psoriasis since age of 12. I got your book and loved how you explained everything. I said I was going to make myself my next big project, this giveaway looks like a big support in creating that. Thank you. I would love to win everything in the Self Care Goodies Package, in addition to, of course, everything else that’s included in this awesome giveaway! I am most excited about the spices! I’m excited about the Vital Proteins! Wow…what-a-prize! There are so many things included in this package that I would LOVE to have, not just one. Good luck to all of us! The signed cookbooks are the most exciting to me, I love reading recipes! There are so many gifts, this is so exciting. What a way to kick off the New Year, thanks for the giveaway! I am so excited about the coaching! Maybe it would give me the courage to live more healthfully. Of course Oura ring and Primal Palate Spices! What an amazing giveaway!!!!! I’m most excited about The Healing Kitchen cookbook! I am super excited about the self-care products! Managing my autoimmune disease has proven to be expensive and time consuming, but I’ve at least figured out what foods to eat and steer clear of. Finding products to use in place of my old ones would be amazing! Also, Angie and Mickey’s new book! I have two of Sarah’s? This is an amazing give away! The Oura ring, spices, gift cards, even a sweet with the carmels—then a plethora of cookbooks and great support package for success, wow! I would love to win the SAD to AIP in Six. I am most excited about how much these prizes can help my sip journey progress! It’s been tough for me with health setbacks and other roadblocks. These prizes would be a fabulous reset for me. I am most excited about the books. I love trying new recipes. Everything looks wonderful! But the Oura ring would be amazing and is something I could not purchase on my own. What an amazing giveaway!!! The ring and signed books! Paleo Life Organics! I’m running low on tooth powder. Paleo on the Go gift card. I never want to spend the money on it, but it would be fantastic to have some great meals that are safe and I don’t have to cook! I’m most excited about the ring! I would love help tracking my health! I would love the cookbooks! I would love to receive the cookbooks! I am super excited about the outa ring and cookbooks!! I love to cook and am always looking for nourishing recipes. The Oura ring will help me better understand my fitness levels. Most excited about the Healing Kitchen – I’m tired of checking it out from the library. Would love the Paleo on the Go gift card! Right after Thanksgiving I found out that I had to go on the Autoimmune Paleo diet which is VERY overwhelming and a complete change in my lifestyle! I would love to have the books and cookbooks to help me find some recipes that I can enjoy! Great products … and your cookbooks are EXCELLENT !!!! Hopefully you can gear a modified gift program next year for your Canadian customers too. It would be great to have an opportunity to win some of those items!! But … keep up the great work. We often feel like an island amongst the non-Paleo friends and family, but your products keep us trucking. Want to try the power balls for an on the go snack. Wow! This is such an awesome giveaway. This is truly an amazing package with so many resources to help those on their health journey. I’m am so excited about the AIP food options and I love Love LOVE Morrocco Method! Thank you so much Sarah for all you do! What a great giveaway! I’m really excited about all of it but the Oura ring is especially intriguing! I’m most excited about sharing the products and information with my mom because I inherited my autoimmune issues from her and she really suffers and struggles. She deserves to win this and finally get some comfort! She doesn’t do Facebook either and misses out on these. I have been following you for several months. Thank you Sarah for putting this all together. Support in the AIP community is amazing. I think I’m most excited about the books. The cookbooks sound very exciting. I just found out I have severe sleep apnea so I’m trying a mouth device but it’s still not at it’s fully tightened position– I think the Oura ring would help me tremendously! I’m always most excited about the cookbooks. 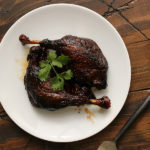 On AIP having a slew of good recipes to choose from is a must! Oooo. The Oura looks cool, but I cannot make up my mind as there are too many wonderful choices! This is the most unique giveaway I have seen! So many useful things for an AIP person. Thank you so much. I would love all of this — I’m hoping to start the AIP after the holidays. What a fabulous giveaway. Would love the Oura ring. Merry Christmas. All of the prizes sound amazing but I’m most excited about the cookbooks and quora ring!! Thanks for such a fantastic and healthy giveaway! These prizes are amazing!!! I would most like the books so that I can continue learning even more! The Moroccan Methods set! I have wanted to try their products so badly but haven’t had the money saved up to do it yet. Thank you for always showing us the best products for our health and wellness! I’m so excited about all of the amazing cookbooks in this giveaway! Many of these are on my wish list already. Thanks Sarah for doing this awesome giveaway! Everything is outstanding! 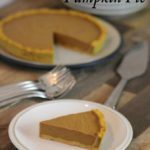 As someone new to the protocol, and has a family with a variety of health issues, this giveaway is like a banquet to the soul! Thank you for making this opportunity available to everyone! The hard copy books, the edibles, and the personal care products! And all the gift certificates. The rest of the items look pretty good, too! Actually, I’d be thrilled to win even one item in this gift package! (I realize that’s not how it works). Someone is going to really enjoy this! How can someone pick one item as the most exciting? The books are essential, the sweet are special indulgences and the gift cards are a great way to try new products. I’m most excited about the coaching, as I feel that there is still so much to learn and understand about AIP. Wow, so excited about all the products it’s hard to pick a favorite, but I’d love the selection of books! These prizes look awesome!! I don’t know which one I want the most, they all look so amazing! I am excited about all of it. I should really be applying the AIP to my life, but haven’t. This might just be the kick start I need! I’m excited most about the AIP-Friendly Products ! I am most excited about the Oura ring! I have a FitBit that I never wear because I don’t like things on my wrist. This would be a great alternative! Plus, it does so much more than the FitBit! This would help so much! 2017 is going to be my year of health! Very excited about the books! I’m excited about the Oura ring – and pretty much everything else! What a great giveaway! I am excited to win all of the cookbooks. I really need help with meals. I am most excited about all of the new cookbooks! I’m constantly looking for new recipes to keep my 2 year old interested in foods. I’m most excited about winning the Oura Ring, and The Healing Kitchen! All your other books are amazing, and I checked out THC from the library and loved it! Hard to pick just one, excited about it all. Omigosh this is a life changing pack of stuff… Everything you need to get you started! Love the books, and the aura ring would be amazing for my sleeping issues! I’m so excited to start the Sleep Challenge in the new year! I would love to have all those cookbooks! I love finding new recipes. There is certainly going to be one very happy person this Christmas. I am most excited about the Oura ring! I’ve been sick for a long time and Paleo has brought immense healing. Now moving more intense is the next step, and an Oura ring would be the perfect tool to make sure I’m on the rught track! Both my daughter and I have struggled with fully committing ourselves to Paleo. This giveaway package would be the perfect boost to help us on the road to health. We also love, love, love Sweet Apricity caramels. I am excited by all th gifts in this giveaway! But two stand out for me: the Oura ring and the one-hour coaching session. Good luck to all of us! I LOVE Vital proteins and use their products everyday! I would love the coaching session. I have lots of questions and don’t know anyone who is doing the AIP protocol. This is an AWESOME giveaway ?? I’m so grateful for everything I’ve learned from you, Sarah! If I win I’d like to share this with my sister-in-law, Traci. I’ve been talking to her and encouraging her to try AIP. I Love the Healing Kitchen, and I know she would like all the recipes and tips there. Thanks very much!! The self care products, because I need more self care in my life! At 54 years old I developed eczema and now two years later I’m still trying to figure out why. I’ve followed a gluten free, dairy free and sugar free but it hasn’t helped it go away. Time to figure out what to do next. The Oura ring, or any gift cards for shops that ship to Canada. I am excited about the self-care. I could always use more of that! I’m excited about all of these wonderful products. Any one of them would be extremely helpful on this journey. I’ve been evaluating quantified self trackers, and the Oura ring looks quite fantastic. That said, there’s not a prize on this list that I wouldn’t be excited about! All of the cookbooks would be great. I’ll start looking at them as soon as I finish those caramels. Oh my goodness, ALL OF THIS!! Wooooo hooooo! Although I am super excited about all of these gifts, Im most excited for the books and the Primal Life Organics Starter Package!! This would make my wife’s year for sure. I’ve made my only resolution for 2017 — to get healthier. Getting serious about the AIP is a huge part of that commitment. This is such an exciting giveaway – thanks for putting it together, and for sharing all your expertise so generously! You are my “go to” resource for all things Paleo and AIP. I am most excited about the gift cards and Paleo goodies! It’s impossible to choose only one item! This package would be such a blessing to win! In September, I moved 1500 miles to accept a new position. After working only two days, I had to resign after learning the company was involved in illegal activities. I haven’t been able to find permanent full-time work since then and finances are getting tighter by the day. Thanks for the opportunity to win! It’s ALL exciting! But the books would help my family start the next year eating healthy!! I’m excited about all of it but the most curious and excited about the Oura ring. All of this is soooo amazing!! The Oura ring and the barefoot provisions gift card are two things that jump out at me. My husband was hospitalized twice this year and never before . We are working through his issues and it’s coming down to an autoimmune issue. He is willing to travel this path now, and I’m all in to support him. Since I’m the researcher between the two of us, I already know a little and also with him on board it will be easier for me to actual follow through for myself. If I won, I would be most excited about Morroco Method! It’s too expensive to buy but natural hair care is so difficult! The Oura Ring would be a swell prize to win! Wow, so many amazing items! The Barefoot Provisions gc would be a dream!! This is amazing! I am just at the beginning of my journey towards better health, and I’ve learned so much from you. I am most excited about the books and even if I don’t win, I will check them out! Hi. I’m primarily exited about the personal care products and the ‘sweets’. Thank you for doing this. Wow – this all would be amazing!! This would be so helpful. I’d be especially excited to try all the food goodies! I’m excited about the Paleo Spices! We’ve used them before and they are AMAZING! The aura ring looks awesome! I am excited about all of it! The AIP diet and lifestyle is worth it when you have an autoimmune disease, but also so expensive. This package would make prioritizing my health that much easier and reduce the stress of the cost of things! Everything! I’m really interested in the ring though. What a great giveaway! It’s hard to choose a favorite but I think I would like the books best of all. I’m most excited about the possibility of winning an Oura ring!!!! The AIP friendly products pack would be AMAZING to win! I’ve never tried the Vital Proteins brand and I’ve always wanted to so I’m especially excited about that. I’m excited about all of the awesome products, but the Oura ring is especially intriguing! This is the first I have heard about this product! The self care items are nice as well. An AIP package of products would be a Christmas dream come true. To someone like me that has an autoimmmune condition, it is very hard to pick only one thing , especially among the great AIP products found at Barefoot Provisions, Paleo On The Go, and One Stop Paleo Shop. The Oura Ring looks very intriguing since it is a fitness tracker and I know I have sleep issues. That could be an invaluable tool. Books, Books, Books and Cookbooks. Did I say Books? Love you blog and this is amazing!! The recipe book would be a huge help for those struggling or just beginning their journey! Very exciting! I am excited about all of the cookbooks! Wow! What an amazing giveaway! I’m excited about ALL of it! I’ve never heard of the oura ring before… sounds super cool! I am excited about it all! I am an avid reader, and currently am quite the Paleo enthusiast. I can utilize everything here! So many great options! The barefoot provisions gift card would be great! Such torture to have to choose…I would say SAD to AIP in six weeks. This is an awesome giveaway. Thank you! Oh, my goodness…how do I choose? Maybe the One stop Paleo shop gift card to pick out my own goodies. All the cookbooks look fantastic! I’m excited about everything in this giveaway, but I would especially love to have all the cookbooks! My family and I pretty much only eat home-cooked Paleo meals so new recipes would be amazing! Oh, my goodness, how can you choose? If I have to pick one thing, it’s all the signed cookbooks! What an incredible giveaway. Thank you! I have been in a battle with my health for a while now. I’ve finally come to terms with the fact that I need to do AIP. I have so many things going on with my body and I’m feeling overwhelmed to say the least. Winning this giveaway would be amazing!! The cookbooks and Vital Proteins!! Yes, I am excited the most about the AIP books. I am reading those – some of them are already part of my every day kitchen routine – like some other people read crime thrillers. They inspire my own cooking so much! Thanks for collecting all those valuable ressources. Great holidays to all of you! I don’t think there is any way I could pick one favorite! 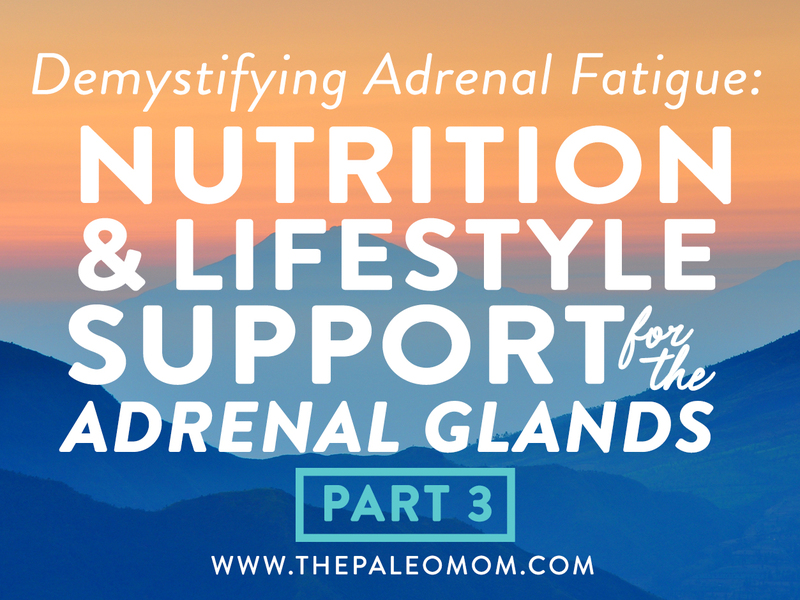 I have Addison’s Disease (aka Adrenal Insufficiency – autoimmune of adrenal systems, which is very different/much worse than ‘adrenal fatigue,’) which also causes hormonal and fertility issues, and also have fibromyalgia, CFS/ME, and Myofascial Pain Syndrome among other things. It took me over 10 years and 60 medical professionals covering every kind and specialty you can imagine to get my diagnosis of something I have had for nearly 30 years and has effected EVERY part of my life, and can be fatal if not treated. The ONLY traditional medical treatment are steroids, daily, for life, and even missing one dose could be fatal. I have been doing a lot of research and prepping to go AIP in the last 6 months, and am almost ready to go all in, dietary, stress, sleep, and any environmental/cosmetic items as well. This entire package would be a huge help and life changing for me! Each one of these things would benefit me in a multitude of ways, but probably the coaching for moral support, would be most beneficial, next to the ring, as my circadian rhythm is very badly off kilter, the books to help add to my dietary options, as I feel like I have almost been going through a grieving process prepping for this and am petrified I won’t have the energy to prep food to stay on track, the gift cards to fill in when I don’t have the energy, and the self care products, because otherwise, right now it’s cost prohibitive. I really hope I win this! I can’t tell you how life changing ot would ALL be! I already have the set from Thanksgiving, your original AIP Book, Go To Bed, and the meal planning app (which is fantastic, btw!) So this would completely set me up to where I am ready to reclaim my life in 2017! I’m most excited about the AIP books and cookbooks. But would love everything in pkg!!! I would love the Morocco Method items!! Been wanting to try them for a long time. The books! I’m someone who has struggled with an AI disease for almost 25 yrs and is eager to relieve as many symptoms and get off as much medicine as I am able. I’m most excited for the coaching! I am most excited about the AIP-friendly products. I’m most excited about all the AIP goodies! The Paleo Approach cookbook and the One stop Paleo shop GC! I would love to have the Oura ring…it looks like a fantastic tool. I would be excited about owning the collection of cookbooks…what a great resource! Thanks for the giveaway! The books have me the most excited. Lots of goodies!!! This all sounds amazing! More for our adventures in good health! Wow! You’ve outdone yourself! An amazing blessing for the winner. I hope it’s me! I am most excited about either the aip book set (because I love to read), or the products. Either would be awesome!! Thanks for all the work you do on this site, and the time/research you put into it. Very much appreciated and used in our household. This giveaway looks great! Thanks! So many wonderful things here, and great cookbooks! Thank you! What an amazing “coincidence!” I am starting my AIP adventure in January (after the next (and FINAL?!?!) round of medical tests) and am so excited to enter to win this giveaway. I am most looking forward to the coaching calls because- it sounds very dramatic to say this, but it’s true- my life depends on it. I am nervous and hopeful (but mostly nervous) to get the AIP right. So many awesome prizes! It would be awesome to win! I’m most excited about the caramels and power balls! I would love any of it!! its all great!! All of it is amazing. I’ve been wanting to try some of the self care products so that would be exciting. This is an awesome giveaway. I’m most excited about the Oura ring. Starting my AIP journey in January and I’m excited about all the cookbooks! With a family of five, I’m on the hunt for great staple recipes everyone will love! The Oura ring looks awesome! I’d love any of the AIP-Friendly Products! Thank you for such an amazing giveaway! With severe eczema and histamine intolerance, I need all the help I can get. Happy holidays! The Oura ring sounds really cool! I’ve been an insomniac for over 35 years and have tried everything! I am most excited about the books, and the Paleo on the Go gift card. Actually, all of the things! What a great gift bundle. The oura ring sounds cool! I am excited about everything! The caramels may slightly edge out though. The cookbooks!! I already have three of your cookbooks, but none of the others. Since I am just starting AIP Paleo, I would love the entire package!!! I would love to have more cooking resources! I think I’m most excited about the Power Balls. 🙂 I’ve been wanting to try them, but can’t justify the shipping costs.